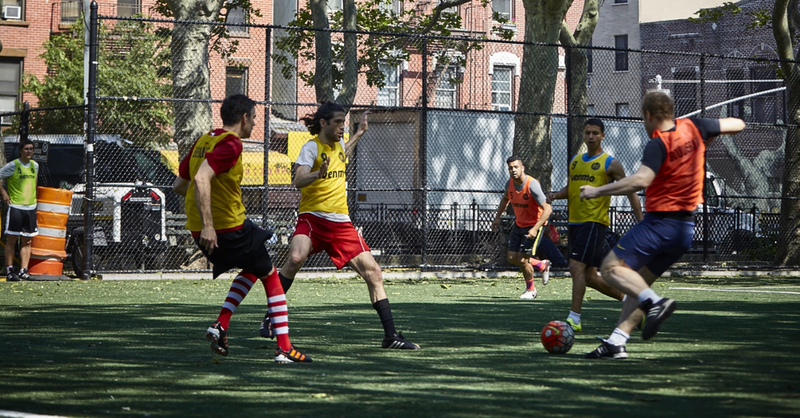 Bowery FC is the first club to emerge from New York City’s historic Bowery neighborhood and is widely known as one of the most competitive, organized, and friendly organizations in the city. With over a decade of existence, BFC has evolved from a small 7-on-7 pick-up game to a club of more than 50 active members. Past and present members hail from almost every continent and more than 20 countries around the world. BFC continues to grow with each new face it welcomes. has received visitors such as The Steve Nash Foundation, FC Barcelona, Paris St. Germain, NYCFC, and Manchester City as well as some of the world’s most recognizable athletes: Jerome Boateng, Thierry Henry, Youri Djorkaeff, Claudio Reyna, Jozy Altidore, Landon Donovan, Robbie Fowler, Edgar Davids, Salomon Kalou, just to name a few. most popular pitches in one of the largest cultural melting pots in the world. It is a prompt and year-round kickoff—so be on time and be ready to play, rain or shine. 3–4 teams are usually present, and the session goes for two hours.